What are affirmations? And do they really help you when it comes to manifesting what you want? Affirmations are simply empowering statements that you can write down or say aloud to help you reprogram your subconscious mind. Hey guys! And thanks for stopping by the blog to read this post. I have had affirmations on my mind lately and thought I would go with my intuition and write about it. So here we are. How To Use Affirmations To Help You Manifest What You Want from Amy Morton on Vimeo. What are affirmations? And will they really help me? A lot of people will say no they don’t help. They are just words that you are saying to yourself. But really, I think they are more than words. And if you say them more than once. And get in the habit of saying your affirmations every single day (make it a part of your morning routine!) they will indeed help you to shift your mindset and manifest what you want! The key to saying your affirmations is the feeling or emotion that you put behind the affirmation while you are saying it! The feeling is all that matters! It doesn’t matter what you really say, it’s the emotion (energy) that you are sending out to the universe that is going to help you to manifest what you want. Get clear and know what you want! When you know in your heart of hearts what you want in life, then it becomes easier to make a plan of how to get there! You can’t just say what you want and not take some sort of action to get to your goal. And remember that you have that dream inside of you for a reason! It’s not just something that you thought up out of the blue. Especially if you can’t stop thinking about it! And if it’s something that really lights you up and makes you feel good, then it’s something worth pursuing! What you focus on expands, so focus on the GOOD! Ignore that jerk. It just wants you to stay comfortable and cozy. It doesn’t like it when you try new things, get put in new situations. And it hates change! You have to KNOW & BELIEVE that you can do it! When you believe in something before actually seeing it with your physical eyes, this is showing FAITH in the very truest form! The wind blows, but can you actually see it? You can see the effect it has on the leaves in the trees, but you can’t actually see the wind. Yet you believe it’s blowing! Radio waves help us to transmit data. But you can’t see it. But you still know it works! Oxygen! The very air we breathe that keeps us alive is invisible. But you still know it’s there! What about gravity? You know that gravity exists and we can measure it. But we can’t actually see it. I always loved this Bible verse. John 20:29 (When Jesus was talking to Thomas after being resurrected from the dead) Because you have seen me you believe. Blessed are those that have not seen me but yet they believe! Show your faith by believing that anything is possible! And that God is not limited in what He can do! God created this awesome amazing Universe that we only know a fraction about. All I know is that when I started showing and believing in the positive aspects of my life, that my life started getting dramatically better very fast! And that by learning to shift my mindset and control my thoughts, I have been able to see results! And you can too! Do you ever find yourself repeating a thought to yourself day in day out? And is it usually a negative thought or a worry? Like, “I never have enough money. I can barely make it to payday. Bills are always piling up.” etc. When you say things like that to yourself over & over, what usually happens? The thought becomes your reality! Why? Because you have it on a loop in your mind. It’s repeating itself over & over again. And with enough repetition, the subconscious mind takes that thought to be the truth! And that is what will show up in your reality! But did you know, that positive thoughts are 10 times more powerful than negative thoughts! So that you can learn to reprogram your mind with positive affirmations. And put them on a loop inside your mind just like you do the worrying. And soon your subconscious mind will take those thoughts to be FACT! Isn’t that awesome! So know this, just because you have had thoughts like these in the past, does not mean that you can’t change it. You can change it and make your future even better! So start today! What are some affirmations that you can say today that will help you to manifest what you want? Do you know what you want to manifest? Remember, getting clear on what you want is the first step to manifesting. So figure out what you really want in life. Write it down. Then make some power statements that will help you to believe that it will happen. Some example affirmations to help you get started! Act as if you already have what you want! What does the version of yourself that you want to be, have? What does she/he feel like? Act as if you are that version of yourself NOW! How can I feel those feelings right now? Dream big! Don’t dream small! Remember when you dream big if you manifest a fraction of that big dream, that is better than none of the small, mediocre dream. Stop limiting yourself. And learn to let go and live NOW! And don’t give a flying fig what anyone else thinks! Affirmations aren’t just saying the words out loud, but by actually feeling the feeling! Use them like a Mantra when you feel negative feelings or thoughts coming on! Notice that when you are up-leveling your life and moving forward that the EGO comes out to rear it’s ugly head big time! When the ego is in your head trying to fill you full of what you can’t do, that is when you know that you are on the right track! Don’t be fooled by the ego. Let it talk all it wants to, just ignore it or tell it to stop.. When you go thru the upleving process and your ego is trying to fight you tooth and nail, then KNOW in your heart of hearts that you are on the right path. And continue to put yourself out of your comfort zone! When chaos is around you that means that your life is moving out of the comfortable settled life that you have found yourself in. And you are growing!!! Keep doing things as much as you can to get out of being comfortable! Content with life and being comfortable are two separate things! I hope this post has helped you! And I hope it has inspired you to keep moving toward your dreams! If you got some value out of this post, please consider sharing it out! I would love to hear your thoughts. Feel free to leave a comment. And always remember that other people can learn as much from your comment as they can from my post! We are in this together! Till next time dear readers! 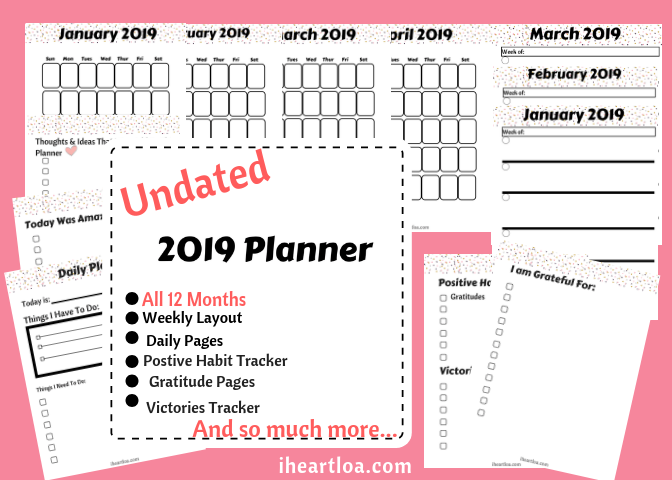 Become A Valuable Member of My LOA Family & Receive A Free Undated 2019 Planner. This planner has all 12 months. Daily Pages, Weekly Pages, & so much more! Don’t worry, I only send out email once a week. You can unsubscribe at any time. Keeping people inspired & motivated to manifest their dreams!